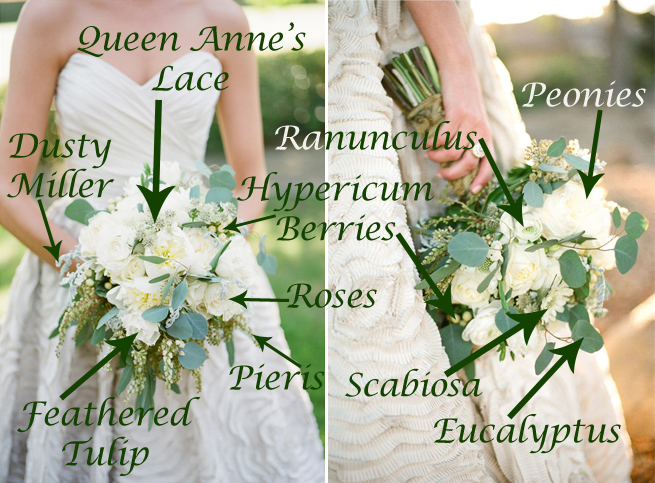 Home Bouquet Breakdowns	Bouquet Breakdown: Green and White Wedding Bouquet! Plus, Centerpiece Breakdown! Last week, I featured several gorgeous Green and White Wedding Flower Ideas, including some Spring Green and White Wedding Ideas, a Bouquet Breakdown of a Green and White Bridal Bouquet, and a stunning Real Wedding which featured Fresh Green and White Florals. Well, one of our readers, Mariah, asked if I could do a Flower Breakdown on this Real Wedding, and I am happy to deliver just that! 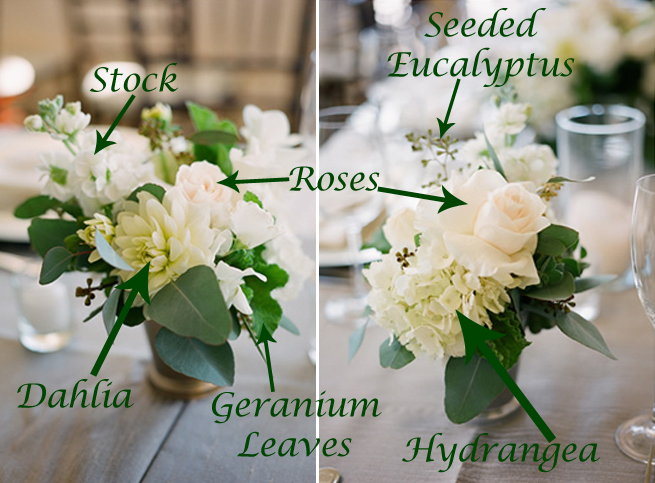 So read on to check out a Bouquet…… and Centerpiece Breakdown! All floral design was done by A Beautiful Day Productions. 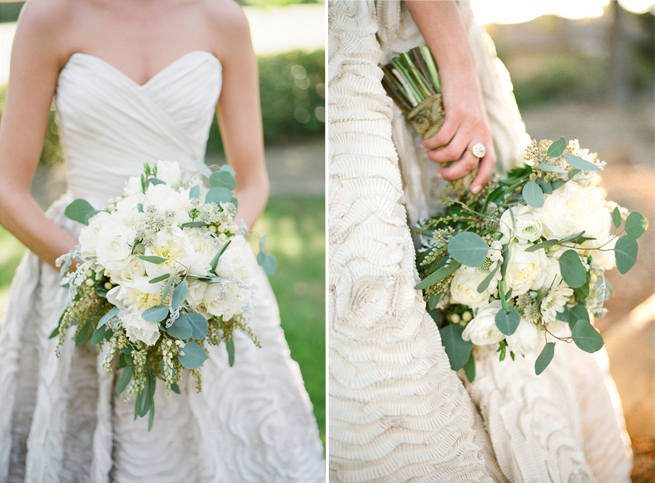 This Bridal Bouquet is loaded with creamy white blooms, so I hope I got everything! Flowers Used in this Bouquet: White Peonies, White Ranunculus, White Roses, White Fringed/Feathered Tulips, White Pieris, White Scabiosa, Ivory Hypericum Berries, Queen Anne’s Lace, Dusty Miller and Eucalyptus. These smaller arrangements were placed in between larger arrangements and were then placed down the center of long feasting tables. I could not find a good image of the larger centerpieces, but I would assume they were made up of all the same flowers that were used in the smaller arrangements as well as the flowers that were used in the bouquets. 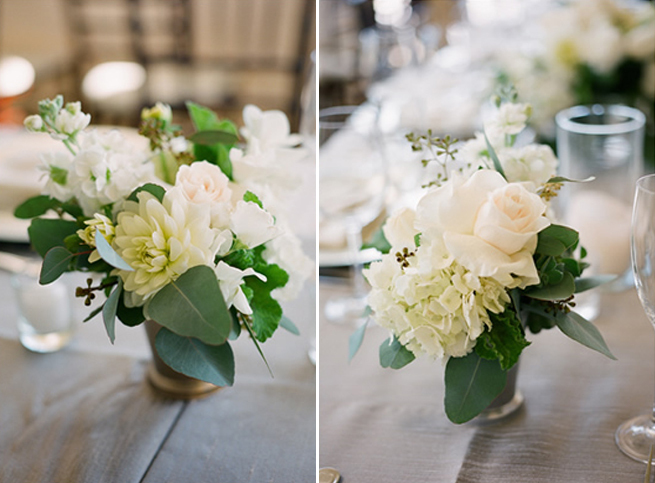 Flowers Used in these Centerpieces: Ivory White Hydrangeas, White Dahlias, White Roses, White Stock, Seeded Eucalyptus and Geranium Leaves. Well, there you have it! Special Thanks to Mariah for reading our Blog and asking for this breakdown! And as always, if you need a bouquet broken down, just leave a comment with a link to the image and I will do my best!